Forensic laboratories are often confronted with a need to analyze hundreds of "white powders" for the presence of drugs of abuse or otherwise to determine their harmless nature. However, a typical "fast" analysis utilizing a standard GC-MS can take 20 minutes (full analysis cycle time including chromatography and cooling back for the initiation of next analysis). Thus, there is a growing need for improved instruments and methods that are capable of much faster analysis cycle times, while retaining good separation and high quality mass spectra for identification purposes. Heroin, like many other drugs of abuse, is sold in the streets as a powder mixture which typically contains paracetamol (also named acetaminophen) and caffeine as its major ingredients and a few percents each of 6-monoacetylmorphine (coeluting with some acetylcodeine), heroin, papaverine and noscapine in order of their GC elution times. Thus, a fast street heroin analysis must preserve the proper separation of all its major ingredients while providing full separation of the heroin itself for its quantitation and eluting the last to elute noscapine and anything else that might otherwise contaminate the column. In this post we present the details of our rapid analysis of heroin. We used the Aviv Analytical 5975-SMB GC-MS with Cold EI for achieving very fast (under 3 min) full analysis cycle time of street heroin powder for the determination of its heroin content. We note that this 3 min full analysis cycle time includes sample handling while covering broad range of volatility range from amphetamine (MW=136) up to bigger than noscapine (MW = 413). While paracetamol with MW=151 is the most volatile compound in heroin powder the method needs to consider also amphetamine. 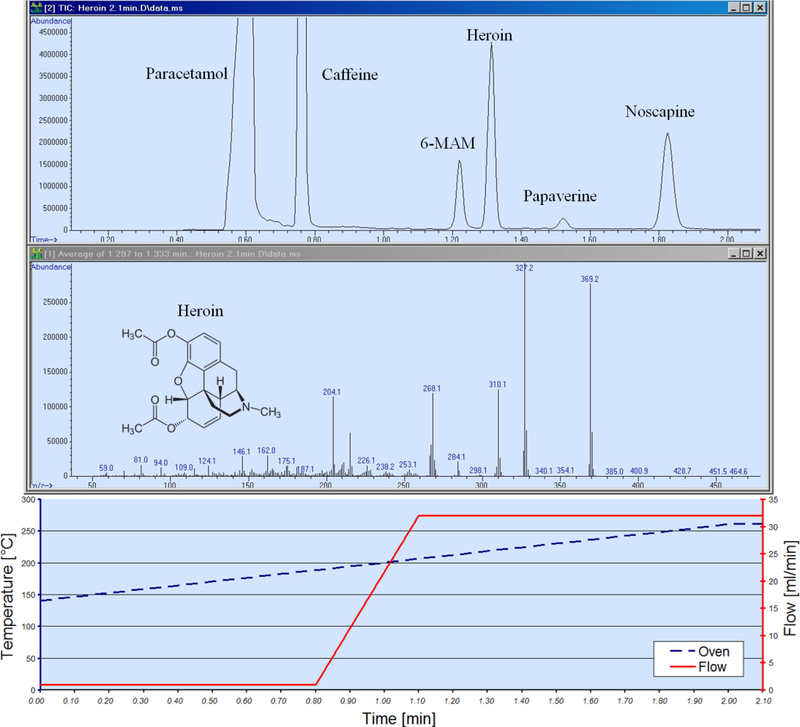 As shown in the figure below, with the Aviv Analytical 5975-SMB all the major heroin powder ingredients are fully separated while heroin itself eluted at 1.3 min and noscapine eluted in 1.85 min with total chromatography time of 2.1 min. We used for this analysis standard 5m fused silica capillary column with 0.25mm ID column and 0.25µ DB-5MS UI film. The main unique feature of our method that enabled such very fast analysis is the use of flow programming for achieving significant reduction of the analysis time. During sample injection the initial GC oven temperature was 140ºC and the heroin sample in methanol was injected with split ratio of 20 (250ºC injector temperature). The filament was turned on after 0.3 min and at 0.8 minutes, just after the elution of caffeine, we initiated a flow program at a rate of 100 ml/min•min up to a final flow rate of 32 ml/min at 1.1 min. Such fast increase of the column flow rate is equivalent to a temperature jump of over 120ºC in 0.3 min. In addition, the GC oven temperature was programmed at 60ºC/min up to 260ºC and then remained at this temperature for 0.1 min. Thus, the full chromatography time took 2.1 min. An additional benefit of the use of the flow programming approach is that the starting flow rate was standard/low at 1 ml/min hence we could initiate the start of the analysis at a relatively high GC oven temperature of 140ºC and as a result cooling back from the final temperature of 260ºC to 140ºC took only 40 seconds which enabled the achievement of full analysis cycle time of under three minutes. Heroin was brought to the laboratory as a white-grey powder and its preparation for injection included adding about 1 ml methanol into a vial and touching the heroin powder by a methanol wetted melting point vial that collected about 0.4 mg powder which was then dipped in the methanol vial for its quick solvation. This simple yet fast sample preparation can be performed during the previous GC-MS run thus does not necessarily adds to the analysis cycle time which remains under 3 minutes. The sample had about 400 ppm heroin powder with approximately 20 ng on-column amount which included around 2 ng of heroin. As shown in the figure above, heroin produced a nice and symmetric peak (MS scan range of 50-500 amu at 6.3 Hz) and the resulting Cold EI mass spectrum is characterized by 90% relative abundance of the heroin molecular ion. NIST library search gave heroin (Diacetylmorphine) as number one in its list with 915 matching (and reversed matching) factor and 96.9% identification probability. The Tal-Aviv Molecule Identifier software based on isotope abundance analysis fully confirmed the NIST library identification and increased the identification probability to 100% combined probability. In addition, the Chemstation percent report provided the information that the heroin percentage in the powder was 9.7% while both caffeine and paracetamol were at around 40% each. Note that Cold EI unlike standard EI provides uniform response hence gives the correct percentage content of heroin which by standard EI was only about 2.3% due to ion source related tailing discrimination of heavy compounds against the more volatile paracetamol and caffeine. Finally, RSIM trace of m/z=369.2 of the molecular ion of heroin gave high signal and no single ion noise, with estimated sub pg LOD. In conclusion: We demonstrated in this note the achievement of very fast, under three minutes full analysis cycle time of heroin in its street drug powder. Good separation was achieved and high quality Cold EI mass spectrum was demonstrated combined with legally defensible heroin identification and an accurate determination of its concentration in its powder.